God has given First Baptist Church of Sidney, New York a beautiful building to use for our Gathered Worship. However that building is not First Baptist Church! The “church”, according to Scripture in it’s basic usage, is not a building or a denomination or even an activity; it is a group of people. This is true of both the Universal Church, which is the group of people throughout the world who are genuine followers of Jesus Christ as Lord and Savior, and also the local church, which is a group of people who profess to be believers in Christ and who meet together in a particular location for corporate worship. So, FBC is made up of professing Christians who have covenanted with one another to come together regularly for Gathered Worship as a united body of believers. 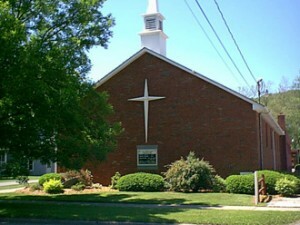 FBC, like every other true local church, is not the building she meets in, but rather it is the members themselves. The membership itself is the church! So the quality of FBC, or of any local church, is measured by the condition of the people themselves! This is the personal confession of each and every Christian and therefore of each and every genuine local church. The members of FBC recognize the absolute reality of these two lessons stated by John Newton. Therefore we openly proclaim these truths to everyone and we welcome into our church fellowship “miserable sinners” who treasure Christ as the “all-sufficient Savior”!